As of December 2016, 58 Fundación students have graduated from university. Bryan Dangla- Systems Engineering - Upoli-Rivas. Darling Cabrera- Tourist and Hotel Management- Upoli-Rivas. Dayana Lara- Systems Engineering - Upoli-Rivas. Ena Sevilla-Bachelor's Degree in Public Accounting- Upoli-Rivas. Gabriela Victor- Tourism and Hotel Management- Upoli-Rivas. Junior Espinoza - English Course - Keyser University. Joselin Romero- English Course- Keyser University. Luis Carmona- Public Accounting- Upoli-Rivas. Kiara Olivas - Architecture- UNAN- Managua. Melina Ponce- General Medicine- UCN-Jinotepe. Maria Alejandra Collado - Teacher - Ricardo Morales Aviles -Jinotepe. Rosa Lorente- Sustainable Tourism- UNAN-Managua. Silvio Cortez- Educational Sciences - Biology- UNAN-Managua. Tania Pereira- Systems Engineering - Upoli-Rivas. Yelany Herrera-Tourist and Hotel Management- Upoli-Rivas. 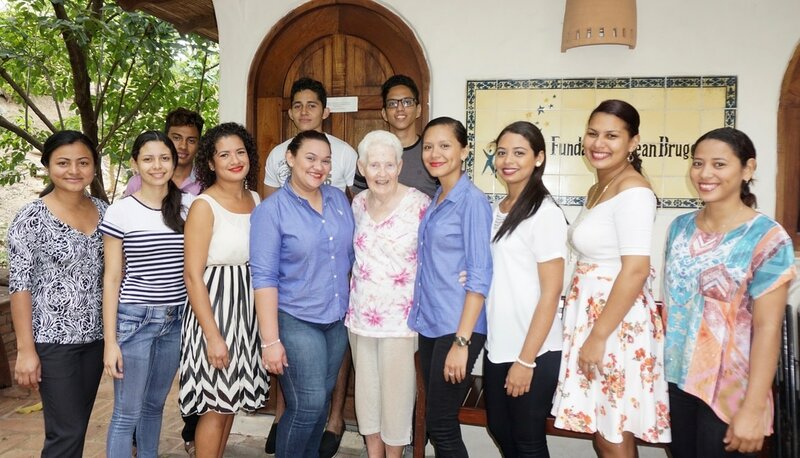 Our founder, Jean, with some of the 2016 graduates. Brian Javier Danglas UPOLI Systems Engineering 2016 Computer Center, municipal govern.